Whenever a property is transferred from one owner to another in California, a “Deed” must be filed with the county. This document not only describes who the new owners are, but how they are holding title, which is referred to as title vesting. So what is the definition of title vesting? Well, ‘vesting’ refers to a legal entitlement to something. In real estate it basically means that that you, the title-holder, are the unequivocal legal owner of the property. Good for you! Title vesting also describes the method used to hold title. There are a few different ways that one or multiple people can hold title to a property, and there are pros and cons to each. Most of the differences have to do with what happens to the ownership of a property when one of the owners dies, and what the owners can and can’t do without the consent of the other owner(s). Just in case anyone is confused, title refers to the actual ownership of real property and encompasses all the rights that come with that ownership. Learn more about what title is here. Vesting is the method by which owners hold title to property. The actual ownership interest (re. Title) does not change from one form of vesting to another, but what can change is an owner’s ability to will, sell, and encumber that interest. There are two concepts that are important to understand when comparing the different options for title vesting: probate, and right of survivorship. Probate – Probate is the legal process of distributing a person’s property when they die. This generally takes place in a probate court, and it can easily become a considerably lengthy and costly process. Some of the vesting options allow for the probate process to be circumvented altogether, which allows the property of the deceased to pass directly to his/her heirs. Right of Survivorship – One of the ways to avoid probate is to choose a vesting option that includes a right of survivorship. When multiple people own a property together, each persons’ interest will be’probated’ separately when that owner dies. But, if the title vesting includes a right of survivorship, than the deceased owners interest would simply be absorbed by the other co-owners, thus avoiding probate entirely. Now let’s go through the different ways to hold title in California. Transfer on Death Deed – This is a new one in California that went into affect in January 2016 (Assembly Bill 139). A transfer on Death Deed is a probate-free alternative to sole ownership that allows a property owned by a single person to be passed directly to a designated party upon the owner’s death. The advantage of this deed is that the property can be passed directly without going through probate, provided it meets certain criteria. 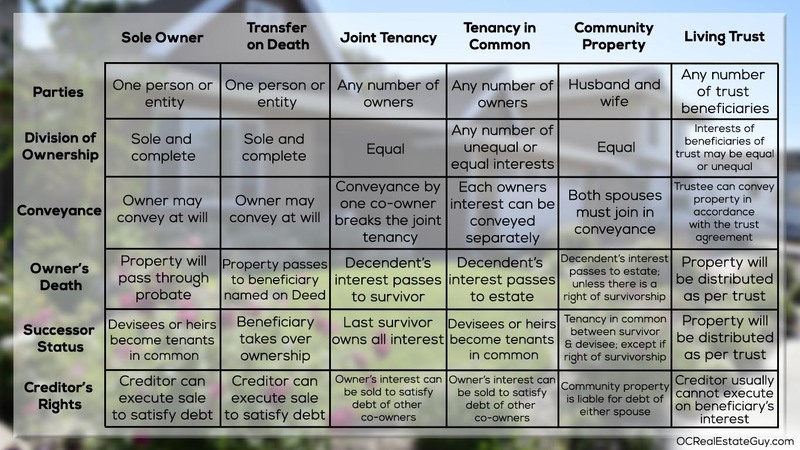 Joint Tenancy – This type of vesting requires multiple owners and includes a “right of survivorship.” This means that when one of the owners dies, his/her ownership is absorbed by the surviving co-owner(s) avoiding the probate process (Yay!). Joint Tenancy also stipulates that each co-owner has equal interest in the property. Because there is a right of survivorship, however, none of the owners can will their interest to anyone else. But, an owner is still free to sell or transfer his/her interest while still alive. Doing so would simply negate the Joinnancy and replace it with a Tenancy in Common. Tenancy in Common – Tenancy in Common allows multiple people to own a property without a right of survivorship. Also, ownership can be divided amongst co-owners in whichever proportions they choose (for example, Jack owns 25%, Jill owns 75%). The ownership interest proportions just need to be defined on the deed, otherwise California will default to equal ownership. With this type of vesting an owner is free to will, sell or even encumber their own stake in the property separately from the other owners. The drawback with this vesting is that, without right of survivorship, each co-owners interest will be subject to probate. Community Property – Community property is a type of vesting reserved for married couples. In California, any property that a married person acquires title to is considered to be community property unless specified otherwise. This means that the husband and wife have equal ownership to the property. If a married person wants to buy property without the other partner, the other partner needs to sign away any claim to it. Community property is owned equally by both spouses, but can be willed separately, so if one of the spouses dies that spouses 1/2 interest will pass through the probate process. There is also an option to hold title as Community Property with Right of Survivorhsip. In this scenario the property would not go through probate, rather, the surviving spouse would assume full ownership. Living Trust – The best way to avoid a property going through probate is to deed the property to a living trust. When the owner dies, the property is then transferred, outside of probate, to a trustee who manages the estate according to the deceased owners wishes rather then the court managing the estate. Posted in buying, Real Estate and tagged avoiding probate, community property, joint tenants, living trust, real estate title vs deed, tenants in common, title vesting chart, title vesting definition, title vesting married couple, vesting avoid probate, vesting deed, vesting real estate, vesting title, ways to hold title in california.